Honor has established itself as a brand that can play really well in the mid-ranged segment and the Honor 10i that launches in the UAE today demonstrates that. Priced at AED 999, it’s the first phone priced below AED 1000 that offers a triple camera setup. The HONOR 10i’s has a 24MP f/1.8 primary camera with a Quadra CFA sensor that boosts light sensitivity for better low light shots while a 120-degree ultra-wide angle lens is added to capture the bigger picture- a setup we’ve seen becoming a standard on higher-end phones. The front of the phone sports a 32MP selfie cam which is most likely similar to the one found on the Huawei Nova 4e. The main camera AI that is capable of multi-scene recognition and recognizing 22 categories of objects under 500+ scenarios. The front camera has AI backlighting image technology that makes sure enough light is captured under all conditions. And, of course, you also have AI beauty algorithms for selfies based on gender, age and skin tone. Coming to the specs, the the HONOR 10i is powered by the mid-ranged Kirin 710 chipset and 4GB RAM with 128GB storage. The 6.21-inch FullView HD screen has a dew-drop notch and an over 90% screen-to-body ratio. It will be based on EMUI 9.0 running atop Android 9.0. 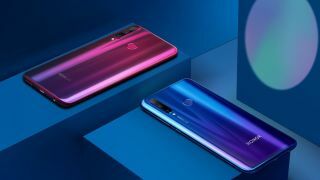 The HONOR 10i will be available in three colors – Midnight Black, Phantom Red and Phantom Blue. Price for the 4GB RAM + 128 GB HONOR 10i is AED 999 and pre-orders will start on the 16th of April with the phone hitting consumers on the 24th of April.